Heliguy is now able to offer professional surveyors the SLANTRANGE 3p NDVI solution for agriculture. Read on to find out how this impressive sensor array can fit into your surveying workflow and also how it integrates with DJI’s product ecosystem. First off, let’s look at the specifications. For more information on pricing or how the SLANTRANGE 3p is applicable to your business — contact the Heliguy team on 0191 296 1024 or email info@heliguy.com. The SLANTRANGE 3p was developed around the Qualcomm Snapdragon processor which means that it features powerful on-board image processing and analytic capabilities. 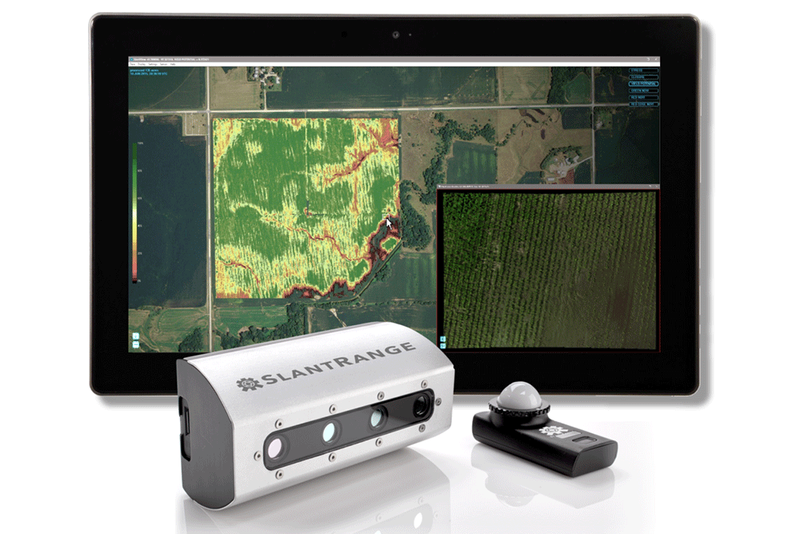 Adding to this, SLANTRANGE is aware that costs matter to their customers (drone operators) and, as a result, they have created a multispectral sensor with the ability to survey more acres per flight while maintaining precise results. SLANTRANGE 3p’s bespoke algorithms require only 20% image overlap, even when operating in late season row crops. Compare that to 80% overlap required by traditional processing methods and you’re looking at 4x less time and money spent collecting data. With the SLANTRANGE 3p, there’s no need for network access or high-end computing equipment. The processing begins onboard, as it carries out its task. Complete, full-product results are available within a just minutes of landing. 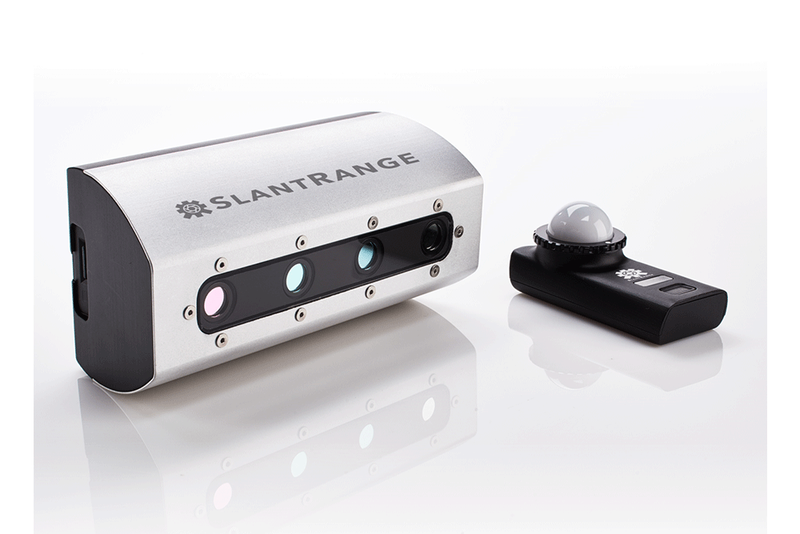 If your work necessitates operation in areas with minimal network coverage or computing accessibility, or even if you don’t have the time for lengthy data upload processes, the SLANTRANGE 3p is the sensor you’re looking for. The SLANTRANGE 3p has also been designed to work seamlessly with a wide range of drones including the industry leading aircraft from DJI. With an integrated sunlight calibration, GPS and inertial measurement units (IMU); the SLANTRANGE 3p can be operated on virtually any SUA. All you need to integrate the camera to your drone is a power source and mounting location. Smart analytics eliminate the need for gimbals or vibration isolation systems meaning that operation is made even more simple. Please Note: Installation kits are required for certain aircraft — please call us on 0191 296 1024 or email info@heliguy.com to find out more. When undertaking aerial surveys, accuracy is paramount. It’s the difference between trusting your paid-for measurements left with the worry that subtle changes in the data are actually a result of inaccurate sensors or improperly integrated software. SLANTRANGE has developed a new approach to ensuring measurement accuracy with the introduction of onboard band-matched solar characterization and radiometric calibration. Smart Filtering, which selectively samples scene elements to avoid the contaminating effects of background soils, shadows, specular reflections, or other noise sources. Traditional mapping techniques don’t make sense for agriculture. SLANTRANGE’s algorithms require only 20% overlap, compared to industry standards of 70–80%. That means you can cover a field 4x faster than using similar sensors at similar resolutions. Put another way, your quadcopter system can start competing with fixed wing systems for area coverage. Uploading gigabytes of your raw data for processing is a costly and sometimes unavailable option. SlantView’s approach to processing is so much more efficient and can be achieved in minutes right in the field. No network connection required. No additional work back at the office. Collect, analyse, and act all in one basic workflow. For more information on pricing or how the SLANTRANGE 3p is applicable to your business — contact the Heliguy team on 0191 296 1024 or email info@heliguy.com. If you’re interested in reading more about commercial applications for drones and their peripherals, keep checking back to Heliguy’s Insider Blog for the latest news, reviews and insights. 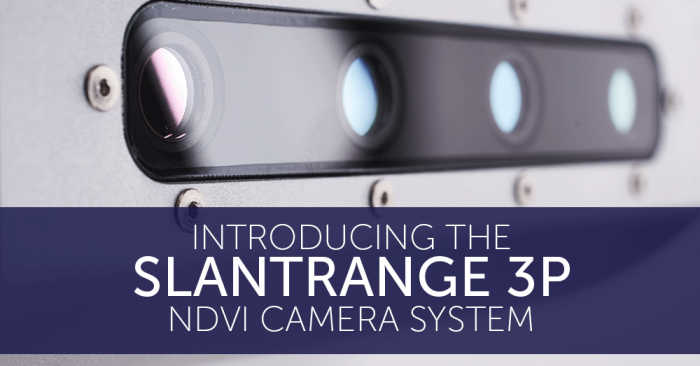 See below for a list of FAQs to answer any questions you may have on the SLANTRANGE 3p camera. What is the resolution or ground sample distance (GSD) of the sensor? At 120 m AGL, the resolution is 4.8 cm/pixel. Flying lower provides higher resolution, flying higher provides lower resolution. What is the pixel resolution of the individual cameras? 1280 (cross-track) x 1024 (along-track), 4.8 micron pixels, global shutter. Do the sensors have their own GPS and IMU? Yes. The sensor does not require any communication interfaces with the aircraft. The only required connection is power. Does the sensor have onboard storage? Yes. The sensor includes 64 GB of onboard storage on a removable SD card. This is enough for ~4 hours of flight time. How do I download imagery from the sensor? The SD card can be removed and inserted into a laptop, tablet, or card reader. The images can be transferred and processed using SlantView. How is the sensor triggered? The sensor is internally triggered and does not require a trigger input. The only required connection is power. The trigger rate can be configured using the SLANTRANGE companion mobile app. What is the size and weight of the sensor? Is the SlantView software required? Yes. Our sensor and software are tightly coupled to enable the unique capabilities of our system, such as flying at 20% overlap and producing a full suite of maps in a few minutes after completing a flight. However, we provide a variety of export options for both the images and the maps to allow you to use the data in other software tools. Can you really fly with just 20% overlap? Yes! This is our recommended overlap for an average flight; this is not a “best case” or “ideal conditions” recommendation. Overlap can be increased for very windy conditions but 20% should be sufficient for most flights. How long does it really take to process the data locally in the field? The image processing begins on the sensor itself while still in flight. Final processing time on the ground depends on the area coverage of your data set and the processing power of your computer but a typical 160-acre flight will process in approximately 15 minutes on a mid-grade laptop. This is completely local processing with no internet connection or uploads to the cloud required. Does sunlight calibration really matter? Yes! Sunlight calibration allows you to collect accurate, repeatable data under a variety of lighting conditions. Sunlight calibration also allows you to make comparisons of data sets over time, unlocking the true potential of airborne agricultural imagery. What data products does SlantView provide? SlantView provides a suite of customised data products to provide accurate, actionable, information to growers, agronomists, and scouts…much more than just aerial images. 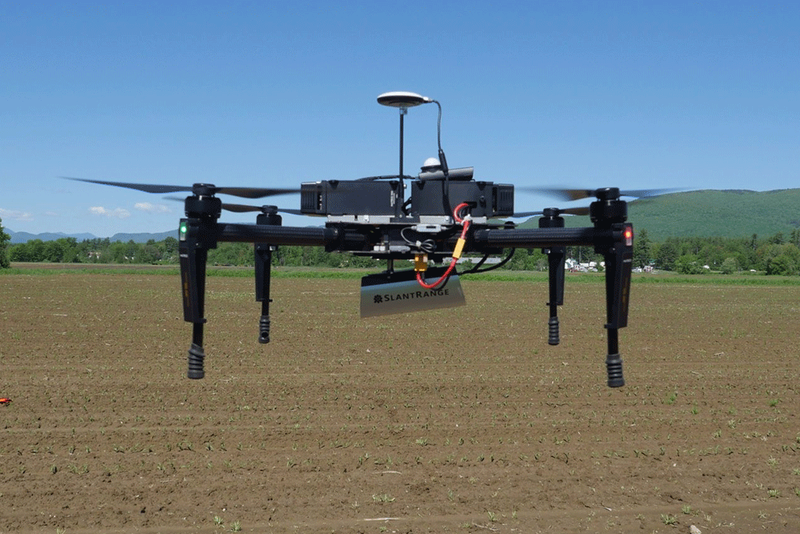 The current set of data products includes high-resolution images and maps of Stand Counts, Weed Detections, Stress, Canopy Closure, Yield Potential, Red NDVI, Green NDVI, Red Edge NDVI, Color, and User-Defined Smart Detection. What are the computer requirements to run SlantView? The only requirement is 64-bit Windows. As a rule of thumb, we recommend having twice as much RAM as your largest data set; 8 GB should be OK, more is always better. What types of file output format does SlantView offer? Both the individual images and the completed maps can be exported as KML (Google Earth), SHP (Shapefile), and GeoTIFF. Can I use DroneDeploy to share data with my colleagues and clients? Yes. Our GeoTIFF exports are fully compatible with DroneDeploy’s map upload tool. Can the data be imported into farm management software packages? Yes. All of the data products can be exported as a shapefile, which is the most common file format for use with farm management software packages. Can I process the data in a software package I already have? Yes, but you’ll need to use SlantView to apply all of the optical and calibration corrections to the imagery. Once complete, you can export the imagery in GeoTIFF format and process the data in any other software package. However, processing in SlantView provides significant advantages, including flying at 20% overlap, rapid offline processing, and access to a unique set of valuable data products. What drones can I use with SLANTRANGE sensors? Our sensors are fully self-contained and are designed to be mounted on almost any drone, both multi-rotors and fixed wings. The only requirements are 1) physical space for the Vegetation Sensor and Ambient Illumination Sensor, 2) payload capacity to carry the sensor and 3) input power for the sensor. How much power does the sensor require? The sensor can accept 9 VDC to 36 VDC and typically draws ~11W. Power can be provided directly from the aircraft or with a dedicated battery. What flight planning software can I use? For DJI drones, we recommend DroneDeploy or GS PRO and for PixHawk-based drones, we recommend Mission Planner. How is the sensor mounted on a drone? 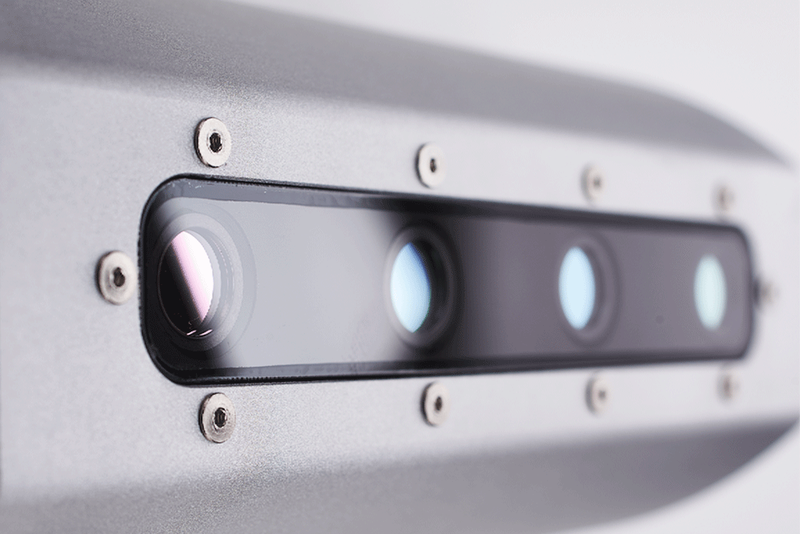 The sensor is typically hard-mounted and does not require a gimbal. For multi-rotors, the sensor should be mounted at an angle to compensate for the pitch of the aircraft while in forwards flight. We sell a variety of simple mounting kits for the most common drone platforms. Does the sensor require a gimbal? No. The sensor is designed to look straight down. All of the cameras use global shutters and are thus not sensitive to vibration like rolling shutter cameras. However, you can use a gimbal if you’d like. What is the recommended flight altitude for the sensor? It depends on what data you are trying to generate. For early-stage stand counts, you typically need higher resolution and may fly lower than normal. For late-season stress maps, you may not need high resolution and can fly higher to achieve larger area coverage. We provide a flight calculator to determine recommended altitude and flight speed based on the characteristics of the crop you’re flying and the data you’d like to generate. Always check your regional regulations for drone flight rules.